The drive for excellence — for continually improving on even our most outstanding achievement — when paired with compelling clarity, sets the stage for achieving or even exceeding the goals defined in the strategy. The question is how do you create a culture of excellence and performance? Excellence is about self-reflection: Without knowing who and where you are in your journey, it is difficult to continually pursue ever higher levels of personal or organizational achievement. What values are of core importance to me? How do I add value? What values are core to the organization? How do we add value for our customers? Am I clear where I am taking my organization? Am I communicating a standard of excellence? 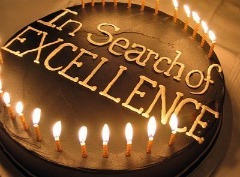 As Tom Peters did almost 30 years ago, go in search of excellence in your organization. Model it, practice it, celebrate it and watch the impact on performance.